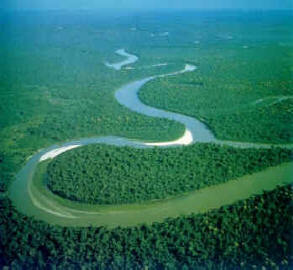 The Amazon rainforest is often analogized to the lungs of planet Earth. If this analogy holds true, these lungs are increasingly parched, dessicated by two supposedly hundred-year droughts that have occurred within a five-year span. According to a report recently published in Science, the Amazon rainforest saw two severe droughts, bad enough that scientists referred to the first as a 100-year drought. The first of these droughts occurred in 2005. Alarmingly, the second occurred in 2010. Put in plain English, what this means is that, during the second drought, the Amazon emitted a significantly higher quantity of carbon dioxide than it did during the first. The Amazon, in other words, is drying out, and, with this drying, switching from being a net absorber of the planet’s carbon dioxide output to a net emitter. This is the granddaddy of all tipping points. If and when the Amazon dries up, the huge quantities of carbon locked away in the rainforest vegetation are likely to be vomited up into the atmosphere. Processes of climate change would be massively accelerated as a result. It’s perhaps not too much of an exaggeration to say that we’ve just discovered that the planet may have lung cancer.